Paringa Resources Limited (ASX:PNL, NASDAQ:PNRL) is a US-based producer of low cost, high quality thermal coal in the Illinois Coal Basin. Paringa’s Buck Creek Mine Complex includes the Poplar Grove Mine (2.8 Mtpa ) which commenced operations in December 2018, as well as the undeveloped Cypress Mine (3.8 Mtpa). Paringa is currently focused on ramping up the Poplar Grove operation to nameplate capacity, and is assessing future development options for the Cypress Mine. 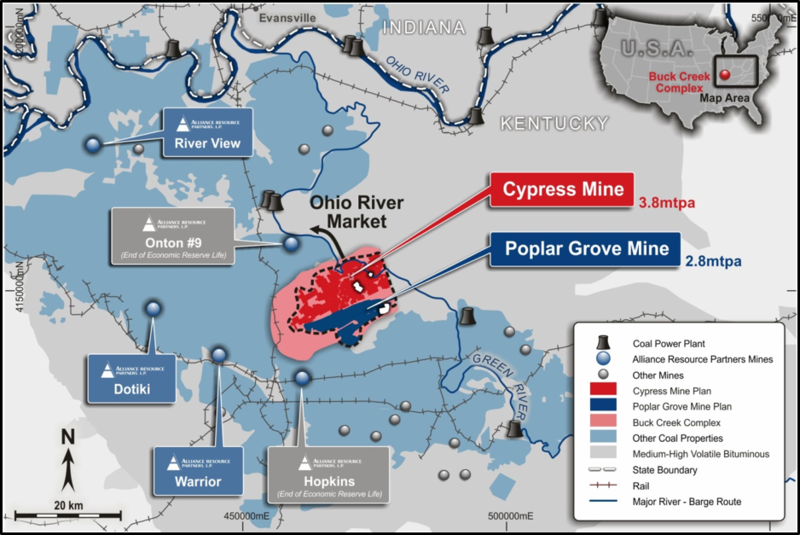 Below is a map of western Kentucky, the location of Paringa's Poplar Grove and Cypress Mines and the extent of historical coal mining in the region. The mineral ownership of Paringa's Poplar Grove and Cypress Mines is unique for the region with Paringa leasing the coal rights from each individual farmer or surface property owner where the mineral rights have not been severed from the surface property. In other parts of the US, mineral rights to coal are generally owned by the federal government or large third party land companies, many of which severed the mineral (coal) from the surface property over one hundred years ago. Operating coal companies then lease large tracts of coal from the federal government or third party land companies by single lease agreements. This is very different from Paringa's land position which consists of hundreds of smaller individual coal leases from local farmers and residents. The Buck Creek area was not developed by major mining companies due to the amount of work and expense required to identify and lease these many small parcels. Since 2008, Paringa and its subsidiaries have secured over 300 individual leases covering an area totaling approximately 41,000 acres.